Written by Student Ben Goody. The end of our project came so quickly. This week we finalised each of the parts to make a complete whole, as well as planned and smoothly executed an event at which we fed, presented and partied with all our supporters. This event was special to us because it represented the culmination of 10 weeks of hard work and it was a first chance to show the community what the future of the SHARE shop will look like and to receive their feedback. After tireless hours and a couple of late nights ( one with cider and chips), we finally finished redesigning the layout of the shop. Upstairs now has new storage units and as a result it is more spacious and easy to find things. The work bench for fixing workshops is also upstairs, giving more room for storage downstairs and more space to work upstairs. In the shop, there is a new desk area, new storage areas – a ‘garden shed’ area and a pallet wall – as well as a more clear window display, so that the many people walking past and looking in the window get a clearer idea of what the shop does. We knew that SHARE has a lot to offer people, and that this was especially true for people in financial difficulties. One of our main missions became to build upon community partnerships to organise a referral scheme so that we could offer use of the SHARE shop for free – with no barriers for those who need it. SHARE can give people access to things that they can’t afford, save people money, as well as making ‘sharing and borrowing’ the new ‘buying and throwing away’. Making SHARE available to everyone will also create greater social inclusivity – a win-win scenario for our current members and the Frome community. If you would like to support us in this mission, please visit our crowdfunding campaign. The crowdfunding campaign that we set up for SHARE was the cause of a lot of frustration and stress – making its completion a great achievement. We wrote and rewrote the story, trying to convey the message in a way that demonstrated how much we cared about this cause and that was presented in such a way that meant the Frome community would support it, too. We had a lot of fun building the video and spent hours filming interviews, scenic shots of Frome, and a ‘party’ dance scene. Editing came next – around two days of staring at a computer screen intensely. And all that effort is paying off as our total money raised towards free memberships for those in need is slowly climbing! Even if it doesn’t reach its target, the campaign design was a great learning journey that we can draw upon in the future. We knew that some aspects of running a successful project like the SHARE shop take a lot of time and effort. 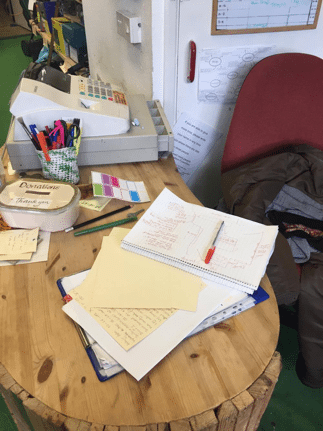 It’s not just about managing the day-to-day operations of the shop, but is a whole host of other things like marketing, social media, events and workshops, and more. To free up Helen, Aliss, and the current volunteer team’s time to focus on running the shop, we have introduced a volunteer scheme for specific roles such as building a community around SHARE on social media, running repair and rehoming sessions, and doing research for the development of the shop. We knew that this could be another win-win scenario because it could provide someone with valuable experience as well as help boost the social impact of SHARE. 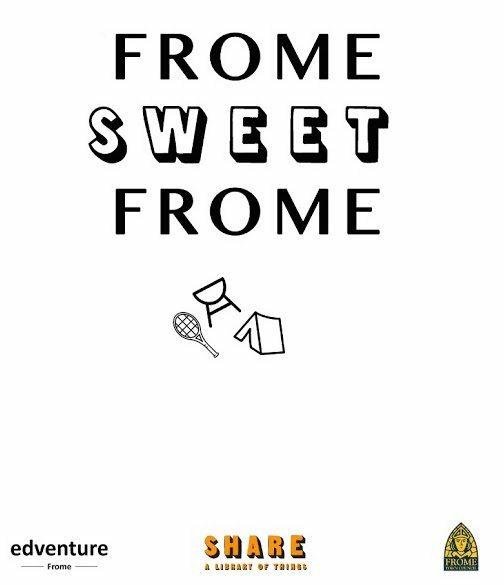 We started to drive an ongoing campaign to reach the Frome community and expand our community through a collection of ‘sharing’ themed posters. The majority of the shop owners in Frome agreed to put them somewhere in their shops, and a few put them up more permanently in their window – an incredible response. We have also printed these on quality poster paper and are offering them as part of our rewards for donating to the crowdfunding campaign. The SHARE website needed a refresh and redesign. After 3 years it had become cluttered and hard to use for visitors and our team. After one long weekend of staring at the computer, it was finished. We gave it a completely new design, with a new layout, new images, and new writing. One thing that we noticed was that many of SHARE’s members had no idea that there was an inventory of all our items online. Although it is an easy to use way of checking if an item is reserved or in-stock, nobody was using it or knew it was there. One change that we knew needed to be made was to make it an easier and clearer route from the website homepage to our inventory. If you are looking for more information on memberships, the history of SHARE, how you can get involved in our community, or want to check out what we’ve got, then please visit the site! What an epic journey it has been, and it all coming together quickly in one week. We started with a little knowledge and ended with a lot, and not only that, we helped move forward a movement for social good. We have helped towards the continued success of the first library of things in the UK and made a close support group of friends for the future in the process. Manda – “I will take away a greater confidence in my role in a group”. Thank you to all our supporters and network that have helped us towards completing the project. Jazzy Jasmine from Vietnam visited edventure for 6 weeks and worked with the student team to develop the Frome Share shop. Jasmine is on a year long fellowship program visiting enterprise education initiatives across the world and hopes to set up something similar to edventure in Vietnam one day.